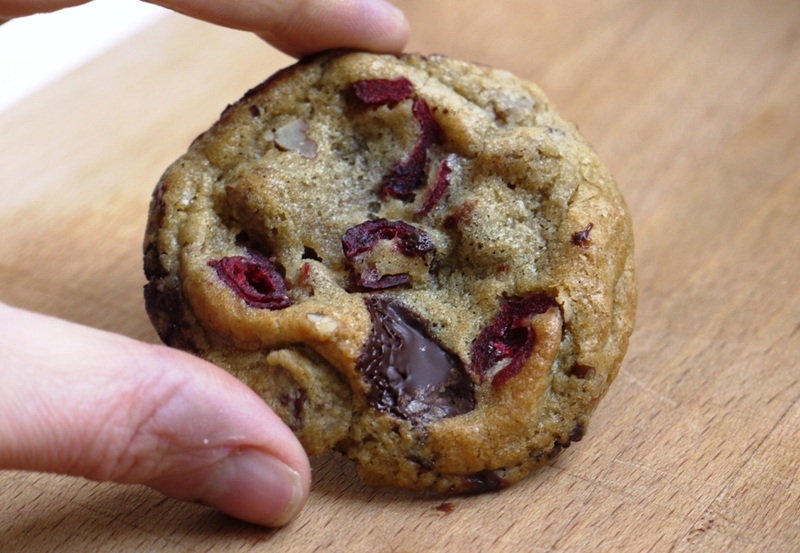 If anyone could invent a way of instantly shipping blogged treats on demand, I’m sure it would make them millions. Of course there are other ways of getting your hands on your favourite bloggers’ baking. Meeting up in person is the logical next step in connecting with the people you talk to, sometimes on a daily basis, online, but may have never met. It can be slightly strange – a little like a blind date where you have to describe what you’re wearing and worry whether you’ll have anything to talk about, with the added oddness that they already know a lot about you: your favourite foods, what you were like as a child and any other anecdotes that may have appeared on your blog over the years – but it’s also rather wonderful. Last weekend I was lucky enough to meet up with three of my favourite bloggers – Kathryn from London Bakes, Emma from Poires au Chocolat and Milli of the eponymous Milli’s Kitchen. It was great to finally put faces (other than a thumbnail photograph) to names and personalities, with extra brownie points to Milli for bringing me, well, brownies (and sausage rolls, honey cake and a number of other amazing treats). However these moments are rare – not everyone lives in London, people have personal and professional lives that often get in the way and it’s not often enough we get to meet up with other bloggers, share stories, recipes and baking. Bring in The Great Food Blogger Cookie Swap. Involving bloggers from all around the world, this initiative hosted by Lindsay of Love and Olive Oil and Julie of The Little Kitchen is a celebration of all things baked, with every participant sending out three boxes of a dozen cookies and receiving three completely different boxes in return. Each blogger taking part makes a donation to Cookies For Kids Cancer (which was in turned matched by OXO) and we all get the chance to share our favourite recipe as well as receiving three different types of cookies from bakers around the country. A win-win situation really. Over the last three weeks I’ve received some gorgeous cantuccini from Italian blogger, Giulia, some spicy ginger snap biscuits from Flick of the Whisk and a package of raisin-packed cookies that remains completely anonymous (if you sent them, please do let me know!). The absurdity of receiving 36 cookies into our tiny two person household in the run up to Christmas when the office is filled with treats, our Christmas tree hung with chocolate and every weekend (and week night) an overindulgence, wasn’t completely lost on me, but between friends, family and the more-ish deliciousness of these cookies, they somehow disappeared. 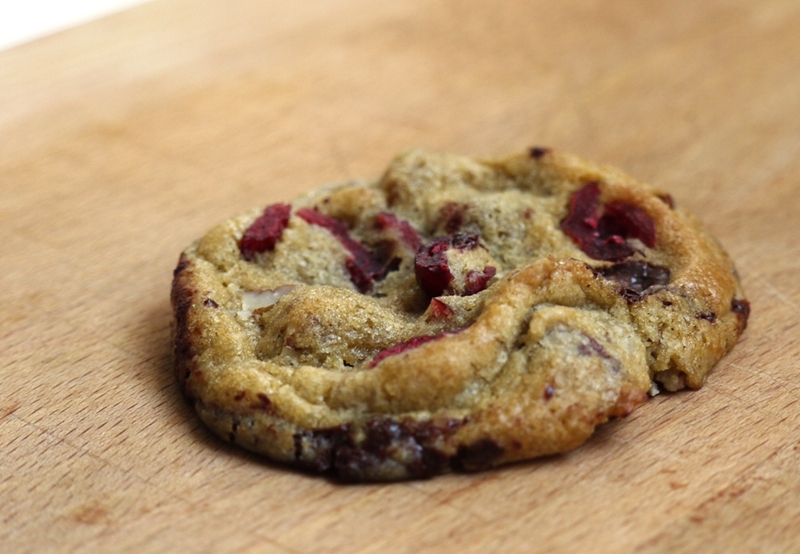 In return I sent out three packages of these chocolate orange, cranberry and pecan cookies. I wanted to cram as much Christmassy flavour as possible into my favourite chocolate chip cookie base and I’m really happy with the results. 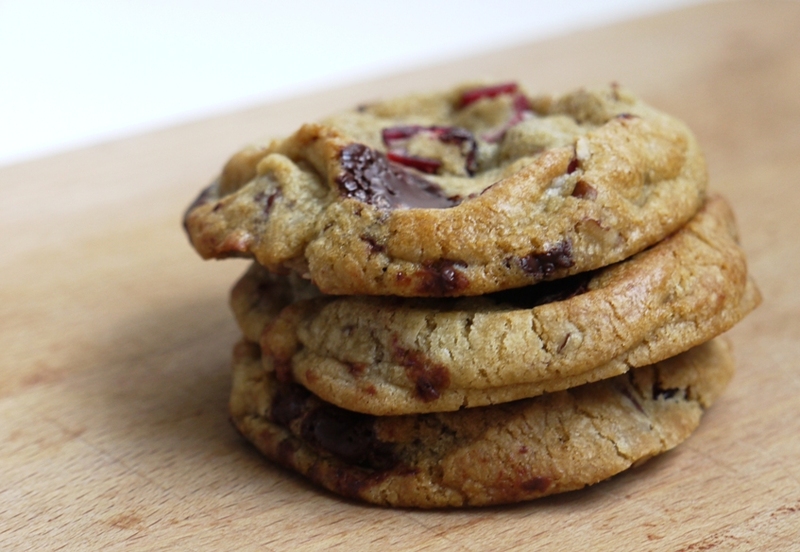 These cookies are warm with spice and toasted nuts, crammed full of chocolate orange chunks and lifted with the slight sharpness of cranberries. Chocolate orange will always make me think of Christmas and the combination of chew and crunch is exactly what you want in a cookie. I was slightly worried that they might have gone a little soft after their journey through the Royal Mail system, and although they’re definitely best enjoyed warm out of the oven when the chocolate is still slightly gooey, the bloggers who received them all assured me that they went down a treat. Make these cookies on a cold winter’s evening. Eat a little dough as you go. Fill the house the smell of toasted nuts and the warmth of Christmas spices. If fifty sounds like more than you can manage, pop the unbaked logs in the freezer for cookies you can bake on demand or make them all and share with friends, family and colleagues. I guarantee that it will make you feel good and put a big smile on the faces of those you share them with. Which is what baking is all about, after all. In a small bowl, whisk together the flour, bicarbonate of soda and salt. In a stand mixer fitted with the paddle attachment (or by hand using a bowl, wooden spoon and a bit of elbow grease), beat together the butter, sugars and vanilla extract until just combined. Beat in the eggs one at a time until well incorporated then stir in the flour mixture. Fold in the nuts, cranberries and chocolate. On a lightly floured work surface, divide the dough into quarters. Shape each quarter into a log approx. 23 cm long, rolling until even. Wrap each log in cling film then refrigerate for 24 hours. This stops the cookies from spreading as they bake and makes a huge difference to the structure and texture of your cookie. When ready to bake, preheat the oven to 180 degrees C and line two large baking sheets with parchment paper. Slice each cookie log into rounds, about 2cm thick, spacing evenly apart on the trays with about 8cm between each. If the nuts, chocolate or fruit fall out of the round, simply push them back into place. 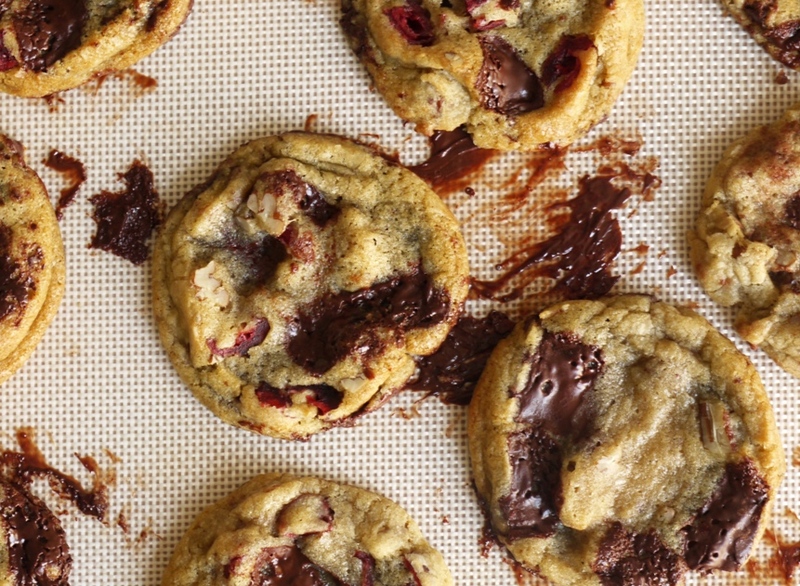 Bake for about 10 minutes, slightly less if you prefer a softer cookie. They should still look soft in the middle when you take them out the oven as they will continue to bake as they cool. Leave the cookies to cool on the baking trays then eat, store in an airtight container for up to 4 days or ship them off to a random stranger and hope to receive some equally delicious cookies in return! Wow! Awesome post! I love cookies lol and I love new recipies!! Well done. I can vouch for exactly how delicious these cookies were and even after a couple of days in the post system, they were still perfect! It was such a lovely combination of flavours too and it really felt like I was eating a cookie made of Christmas. nom nom nom. Oh man these cookies look and sound amazing! Christopher – glad you like the cookies! Kathryn – yey, so glad you liked them! 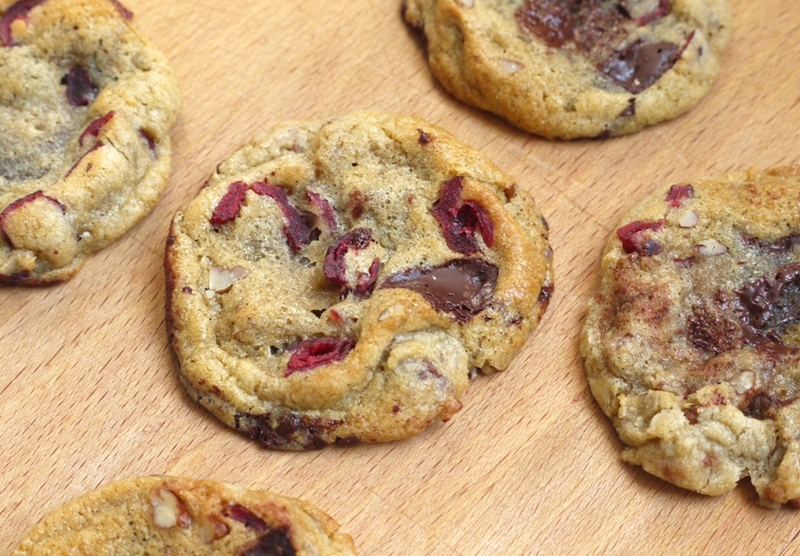 I love orange and cranberry, and I love pecans…but to combine them all, with CHOCOLATE? Yes. Just, yes. This cookie swap thing sounds so lovely, I wish I’d known about it – maybe next year! Oh my gosh, these sound so good. They look like my favorite type of cookie, both in flavors in textures. And how fun that you got to meet up with other bloggers! I love seeing when bloggers do that. Elly – it’s a lot of fun. After all, it doesn’t get much better than receiving free cookies in the post! Frugal Feeding – that’s a crown I’m more than happy to accept! Amy – it was lots of fun, so nice to meet people in person rather than through cyberspace. Oh my! Yum! These sound lovely! So glad to have met you through the cookie swap too! It must have been lovely meeting up with your fellow blogging friends the other night. A bonus of the blogging world is meeting lots of new people with whom you share a love of cooking and baking. Especially good when all my good friends don’t really love it as much as me! It’s sounds like y’all had a great time all meeting up. How awesome that you were able to do that! You definitely made them festive, and so delicious looking! What a great reunion of wonderful bloggers. Laura – so true, some of my ‘real’ friends have been known to glaze over slightly when I start waxing lyrical about a particular food! Erin – they’re super Christmassy, think I need to make another batch before the big day! Those cookies look amazing. Care to post some to Australia? 😉 And how fun to meet Emma and Kathryn, the three of you are such talented bloggers. Definitely lots of Christmassy flavors going on here, they look super tender and delicious and I’m sure much appreciated by everyone who received them. Part of the fun of the cookie swap is definitely being able to taste some of those treats you normally could only see! These are such fun cookies! I love all the mix-ins. These cookies look fabulous! Love the natural, fragrant flavors you added to them too! Thanks for sharing. So true, I felt exactly the way you described when I met a blogger friend this summer in NYC. A stranger and yet a friend at the same time. Jennifer – aw, thank you so much 🙂 I’m not sure the cookies would make it all the way to Oz but maybe you can persuade some other Australian bloggers to take part in the cookie swap? Sylvie – I hope so! 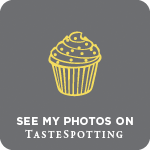 Nuts About Food – it’s odd, but lots of fun! I am a late convert to cranberry…but better late than never! Your biscuits look lovely, perfect to accompany a cuppa! That sounds very Christmas-y indeed! I love love love cranberries and oranges together, must make these soon! Sarah – so glad you like the cookies – pistachio and white chocolate versions sound fab too! thanks you for the recipe – workplace bake off tomorrow and i think they are in with some…… macaroons! hopefully they will pull through.